When starting new with Spire and the company is not using a migration from another product, the GL and sub ledgers require opening balances. 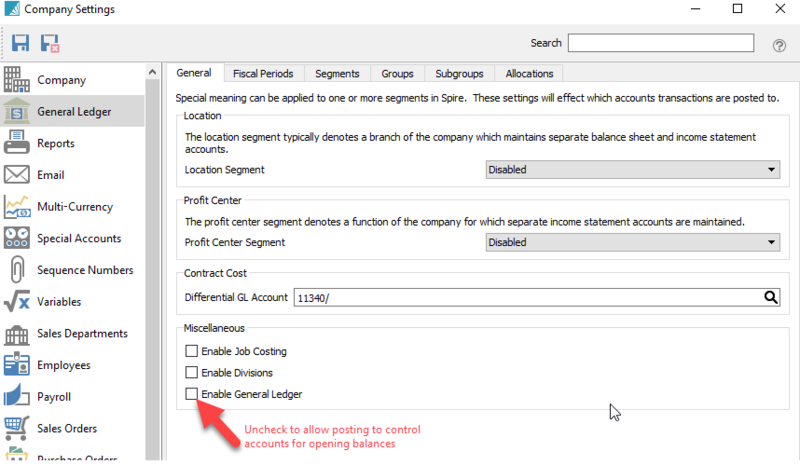 Each of the sub ledgers need to balance to the General Ledger. For instance if the Inventory that is entered or imported has a value of $1,000,000 then the Inventory GL account(s) need to total to $1,000,000. See each of the sections below for instruction on entering opening balances. !It is important to turn off the GL before posting any opening balances because in the case of the GL you will not be able to post to control accounts, and in the case of sub ledgers the posting will include a journal entry and will be added to the already posted GL opening balance.